Learn how to sew a small drawstring bag and you'll be able to reach for a plastic bag whenever you need one. Once you check out this Grocery Bag Dispenser Tutorial you can easily recycle plastic bags and keep them organized for easy use. Watch Maureen Wilson create this project from start to finish in the video tutorial found at the bottom of this page. Lay the fabric face-down on your ironing board. Fold one short edge of the fabric up a 1/2 inch and press. Then fold up another 1/2 inch and press again, encasing the raw edge. This will be the bottom casing for our elastic. Sew 1/4 inch in from the bottom of the casing. Now flip the fabric around to the opposite short end. With your fabric face-down, fold the bottom edge up 1 inch and press. Then fold another inch and press again. This will be the top casing for the drawstring closure. Fold the casing edge back in place. You can press again if needed. Sew the casing 1/4 inch from the inside edge. Now we can add elastic to the bottom casing (the end without the eyelets). Cut a piece of 1/4-inch wide elastic to 6 inches in length. Use a safety pin to feed it through the bottom casing. Stitch both ends to keep it in place. Next we’ll sew the long sides together. Fold the fabric in half lengthwise and pin. Since we have a raw edge, we need to zig-zag it to prevent fraying. Again, stop when you reach the bottom edge of the top casing. Turn your bag right side out. Feed one end of a shoelace through an eyelet on your top casing. You’ll have the opening at your seam as well, just keep feeding the shoelace past it and out through the other eyelet. Finally, thread each end of the shoelace through a toggle to create a drawstring. Tie the ends of the shoelace in a knot to create a loop for hanging. 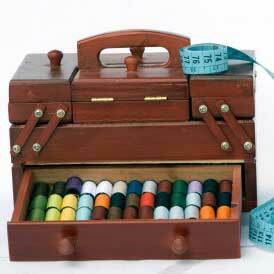 To use your bag dispenser, widen the top by loosening the toggle. Fill will plastic bags, and tighten the toggle again. Tug a sack through the elastic at bottom, and another will take its place. You can hang it on the back of the pantry door for easy access. 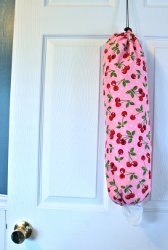 Quick and easy to sew, this grocery plastic bag dispenser really is useful to corral those plastic bags that seem to find their way into every kitchen nook and cranny. I have made a few of these as gifts and they always seem very welcomed, especially since they are put to immediate use! I have made a lot of these for gifts and everyone just loves them.